Since my views have been discussed, perhaps I should clarify them. Let me say this again, out of the four baseline criteria Christian Tietze gives, I do accept three and have problems only with one. I do believe that direct links are more important than he seems to think they are. In particular, I take issue with the claim that: "if full-text search works, manually linking notes will work, too: just put the target’s identifier somewhere, copy it, search for the identifier, and open the resulting note." This claim is not false. Manually linking notes by identifiers is always possible. In fact, if you use a paper-based system, manual linking is the only possible way of connecting notes. You can, of course, restrict yourself to this way of linking in an electronic version of a Zettelkasten, but I have no idea why you would want or need to. In fact, I believe it is a mistake to do so. Christian, if I may, finds that my view amounts to favoring "[[WikiLink]] note connections because they are so darn fast to create if you know the title of the note you want to link to." His reason is: "That’s a situation I don’t ever find myself in. Instead, I have to fish for the correct title of a note with a search anyway." The initial quickness of the free-link approach makes ls only one of my reasons. I admit that, subjectively speaking, it is important to me. However, it is not the most important reason for preferring free links. More important is what I take to be an objective reason, namely that direct clickable links are more effective than indirect links, even if they involve note "identifiers." If your notes have names like this: "201105160958" (as I gather they do from some your claims), then you could actually directly link to this note like this [] in an application that allows free links (and it dos not have to be a ConnectedText nor even a Wiki). So you would not need to think of a descriptive name. If you have back-link capability, as in ConnectedText, it would be trivial to change the link title of the note "201105160958" to "201105160958 - plus something else", and that all the links to the notes update automatically; and this is where back links are extremely helpful. This is also why the decision of how to name a link is always provisional. Nothing commits you to a permanent title, unless you limit yourself in this way. And that is one of the strengths of wiki: it does not break the link even if the name changes. In any case, using unique IDs and links is not contradictory, and I never meant to suggest that they are. The two approaches can well be integrated, and my argument was not directed against unique IDs, but against the idea that indirect linking is just as good. It isn't. The free links make hard connections between topics that allow all kinds of other operations. We have not spoken of semantic links, categories, or other relations, and perhaps we should. Someone commented that I did not understand linking in Devonthink. I never claimed I did. In fact, I think I admitted limited acquaintance with the program. Still, the claim that Devonthink does not allow for free links remains true. Auto-linking does not substitute for direct linking based on a user's decision. One of the main troubles with auto-linking is that the link between a word or a phrase and the page to which it refers is broken, if the page is renamed. If a wiki page is renamed the referring link is also renamed and the link is retained. Nor do you need a wiki for direct links. nValt and other applications (including Devonthink) do direct links. But they do so without backlinks, of course. Furthermore, links in these applications break, if the page to which the link referred is renamed or changed. It is true, you don't need a car for some purposes. I walk as much as I can, and I hardly ever drive to go to the grocery store or anything that is within a mile radius. But when I visit my daughters who live more than 800 miles away it would be impractical to walk. In the same way, a text-based approach works for some purposes, but it is not sufficient for my note-taking needs. Oh ... and to DutchPete: "sliced bread," in my view, was not really as good an invention as everyone seems to think it is. I should perhaps also point out that I am grateful to Christian Tietze and those who responded for allowing me the opportunity to think further about these matters. 1. Corrected on Monday, March 30. I think it might be good, if I could disagree with this review of the Rotring Core, but I cannot. I own one of these monsters, but I have never written with it. Nor do I ever intend to write with it. I also own a mechanical pencil of this model which was inflicted on the world after Sanford took over Rotring. I read somewhere the sarcastic but apt comment that they were probably designed by someone who was employed by a athletic shoe manufacturer before. If I were to use the pen (or pencil), I'd probably also "hold this one in a small brown paper bag. It’s either that or go blind with the horror of the thing." TextBlade may well be the smallest keyboard I have seen. It costs $99.00, but it allows you to touch-type "and literally pulls apart to fit in a pocket." (See here for a review. Well, the problem with the flickering Thunderbolt display has been solved. Bypassing the built-in display cable did the trick. I will try to find out how much it costs to replace the cable, but even if it turns out to be too expensive for me to fix it, I hope that the monitor will last another year or two. Given how much it cost (about $1000.00), it needs to last at least another three years. One thing has not changed: I can no longer connect to other Thunderbolt devices. Trying to put the monitor in second place of the daisy chain (and after the SSD drive) does not work). So, I will have to do without Thunderbolt for now. But, as I said, USB 3 is pretty fast. There appear to have been four issues. First and foremost is the recent security update that broke the Thunderbolt connectivity. As I now know, it affected people who had a third-party SSD drive at the time of the update. I obviously don't know how many people those were and whether it affected only some or all of those people, but I do know that it affected me in the worst way, stealing at least two full days from my life. I understand that Apple couldn't care less about people who did not buy all of their overpriced peripherals but tried to save some money and better performance. Secondly, the built-in cable which seems to be the weak link in the Thunderbolt Monitor—many of them don't seem to work right out of the box—got broken as a result of my moving the Mac Mini several (many?) times during my attempts at recovering from the failed installation. Ultimately I did recover, but don't ask me what actually did the trick. It were problems like this that ultimately made me move from the PC to the Mac. There probably is no way back to Windows without Parallels, and I don't like LINUX, so I am stuck. Thirdly, I did not have a well-conceived backup plan but relied exclusively on Time Machine. Whatever else you do, re-think your own strategy. And, fourthly, right after applying the security update (if not while the security update was going on), the Apple Applications Sore went down and did not get up again until more than twelve hours later. This will be the last post on my present problems with Apple, but I will report, if the issues with the Thunderbolt connection get solved. 1. Since I talked so much about Apple's Thunderbolt Display, you might be interested enough to read this review. When I bought it in early 2012, it looked much better than it does now. SuperDuper v2.7.5 is here, and it's compatible with Yosemite! ... SuperDuper is the wildly acclaimed program that makes recovery painless, because it makes creating a fully bootable backup painless. Its incredibly clear, friendly interface is understandable, easy to use, and SuperDuper's built-in scheduler makes it trivial to back up automatically. It's the perfect complement to Time Machine, allowing you to store a bootable backup alongside your Time Machine volume—and it runs beautifully on your Mac! I have been relying on Carbon Copy Cloner the last few days, and it has been good to me. It costs $39.99, but there is an academic discount of 25% which brings it down to $29.99. The price of SuperDuper! is 27.99. The last few wasted days have shown to me that a program like Carbon Copy Cloner or SuperDuper! are absolutely essential. They have also shown to me that Time Machine cannot be relied on. When I needed it most, it did not work. Nor do I know why it did not work. I could get into time machine, but every backup after the present one was greyed out. I know this now: I should have been more circumspect and have trusted Apple products less. I have not encountered the problem of flickering for more than six hours now. I removed the SSD drive connected by Thunderbolt to the Thunderbolt monitor. Furthermore, I set the Display to Generic RGB Profile and unchecked "Automatically adjust brightness." 18:18: No, it did not fix it. It just happened again! 19:40 Just read this on the Apple discussion forum: "This turned out to be an "All-in-One" display cable or display electronics issue. The way I isolated it was to unplug the Thunderbolt connector of the All-in-One display cable from the computer (leave power connector to computer plugged in). I then plugged in a regular Thunderbolt cable between a Thunderbolt port on the computer and the empty Thunderbolt port on the display. In this configuration everything worked (as I had bypassed the Thunderbolt portion of the All-in-One cable). Everything plugged into the other display ports worked and the display sound and display video camera worked fine." So I did the same thing and connected the mac mini through the thunderbolt port (and bypassed the the built-in cable). So far, so good. I am holding my breath. 1. It is possible that the cable got damaged when I dealt with the failed update and moved the computer and monitor several times. Apparently, the built-in display cable has been an issue for a long time. (One might ask, of course, why the cable needs to be built in, in the first place.) But it is also possible that it is not the cable at all, but that it is a reversion to an old problem. See here. See here for other people who have experienced the same problem and who are annoyed at Apple's lack of response. In any case, my Thunderbolt display now begins to flicker at random times and then turns completely black. So far, the only way I have found to revive it is to unplug the power cord of the monitor, wait a few minutes, and then plug it in again. That is, of course, no way to work (or play). Sorry to bother you all with my problem, but it might be a warning. It's not like I did not read about it before, but it did not affect me until now. My 27 inch Thunderbolt display (I bought it in January 2012) is starting to flicker erratically. This is another Thunderbolt issue, apparently, introduced by the latest "security update." I have just about had it now with Apple's cavalier attitude about this issue. Co-developed by Intel and Apple and introduced in the 2011 MacBook Pro, Thunderbolt promised to be the thing that made us leave USB behind. In simple terms, Thunderbolt is a much fatter and faster pipe for data transfers than USB, and it makes it possible to connect big storage arrays and high-resolution displays to your MacBook. Some four years after its introduction, however, Thunderbolt is still narrowly focused on high-end applications and hasn't been adopted or aggressively promoted by many PC makers beyond Apple. USB 3.1 with the smaller, reversible USB Type-C usurps the entire purpose of Thunderbolt cables for regular consumers. It lets you plug in your external hard drives — which make up the vast majority of the 50 Thunderbolt products on Apple's online store — and pushes video out to external displays. Type-C is easier to use than Thunderbolt and appears to be cheaper to implement, making it a no-brainer upgrade. Simple, less expensive, and still fast. My thunderbolt SSD setup worked for a little while (a few hours), but then it stopped working again (after the computer went to sleep). I will give up on it for now and use USB 3, even if it is slower. Nor is this the first time that if the computer goes to sleep, thunderbolt loses track. The display stays black, and I cannot access the application. Nor am I the only one who is having problems with this! I seem to be out of the woods (after more than 20 hours). Carbon Copy Cloner was the answer. I now have a bootable copy of the SSD drive on the MacIntosh HD. I am on the 30 day trial, but I will buy it. Time machine may be enough for files and directories, but it is not sufficiently reliable for restoring the entire system. I will use Carbon Copy Cloner for weekly backups. It costs $39.99. My mac mini downloaded a security update yesterday. Since then, I have major problems. I spent almost eight hours trying to fix them last night. I used to run OS X from a SSD connected to the computer by a Thunderbold cable. Thunderbold stopped working altogether. Apparently, there is also a serious problem with a new driver for thunderbold that was released a couple of days ago. What got unsuccessfully updated was the MacIntosh hard drive. Nothing worked any longer. I just saw the spinning wheel going on forever. Tried to boot into Time Machine to restore the system from it. Didn't work. Tried all kinds of other things, they did not work. Finally I connected the SSD with USB 3. I could start it, but the MacIntosh Hard Drive could not be accessed. Tried to install Mavericks again. The installation was stuck at "2 minutes left" forever, and ultimately did not work. At some time during this process, the Mac app website must have gone down. In any case, I could not download Mavericks to do a clean install from a USB drive either. I don't remember what else I tried that made the problem worse. I stopped working on it at 4:00 AM. I followed the instructions I found on the internet (unplugging the monitor for more than five minutes, etc.) But it did not fix the thunderbolt issue either. It is frustrating, to say the least. I am used to this kind of trouble from Microsoft, not from Apple. I wonder whether these are some of the first signs of sloppiness, resulting from Steve Job's absence. 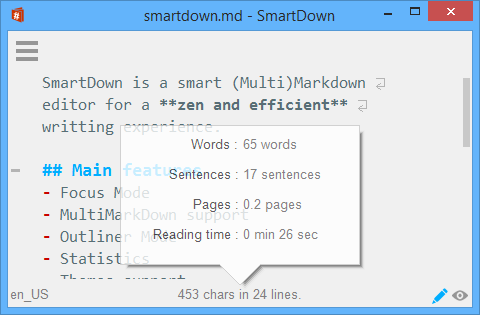 Smartdown is, first and foremost, a no-frills markdown editor. The developers, more pretentiously, call it a "zenware" editor. But they make it clear that "zen" for them just means "simple." Secondly, it is also a folding text editor, like foldingtext. It is simple, but it is also elegant. There is a Mac version and a Windows version. The Windows version is hyped as "A native Windows Mardown [sic] editor made with love for a zen efficiency. A nice place to express your creativity. With the focus mode and the fullscren [sic] presentation, discover a distraction free zen environment for enhancing your writting [sic] productivity. You can focus on your text, not on the tool." Among other things it has Critic Markup Support and built-in spelling. SmartDown also supports snippets that allow you to substitute predefined text for an abbreviations. It is developed by Aflava, "a small software company base[d] in Lyon (France)." Its "introductionary [sic] price: $24.99 -> $19.99," but you can download and try it for free. I did not try the Windows version. But judging from the Mac application, it is is much better than the spelling suggests. The Mac version seems to be developed by the same company under the name of "mobili." It does not have snippet support or spelling (which makes me suspect that the Website for the Windows version was written with the Mac application). But it has footnote support, and that is why I chose to test it. No price is listed, but "SmartDown has just been submitted to the Mac App Store. Crossing fingers…"
I do like the application. Inserting a footnote is a two step process. First you provide the footnote reference, then you type the footnote. It works well, but the footnotes are not transformed into automatic footnotes when exported to rtf, and the ugly convention of "[^1]" is retained rather than transforming them into superscripted numbers or other characters. In Markdown preview the footnotes look a lot better. The applications are rough around the edges, but they have a great deal of potential. Not only do they look better than Ulysses, they seem to do what Ulysses does in a much simpler way. I will keep an eye on them, even if they are not likely to be serious competition for ConnectedText. I hope I do not sound too negative. I really like the way the applications look, and, to say it again, they have a great deal of potential. it matters why students want to acquire knowledge in the first place. Using the mind as a means to acquire a corner office is very different from enjoying intellectual activity for its own sake. This is not a distinction irrelevant to the madness of college admissions. ... college brochures took their own rhetoric about falling in love with the life of the mind seriously, they would encourage students not to see their studies as purely instrumental. Career services programs love to boast that you can study German literature or philosophy and still get a job in consulting; but whether or not this is true misses the point. Really, it does! See also: Exercising control over how and what you think. Sketchnoting seems to me like just "playing around" and I have no idea what to make of it. See also here. There are some sketchnotes that are to be taken more seriously, but I still do not "get" it. See Sacha Chua's blog, for instance. These images just make me dizzy, and the time spent on creating them would have been better spent on taking thorough notes—or so it appears to me. I am willing to be convinced otherwise, but it won't be easy. For those who use the Cornell Note-Taking Method, these these notebooks may be of interest. They are also available in legal-size pads. Staples is not the only place where you can get them. Nor is it really necessary to have the sheets pre-printed, but they are convenient. 1. For a more extensive review, see here. I have referred to the software reviews by Paul J. Miller before. Here is one about his usage of ConnectedText since 2012. (Just for the sake of open disclosure, I have been using it since 2005.) Miller's review is thorough and honest. He does discuss what he takes to be the good points just as much as what he takes to be the best points. Thus, he finds that the implementation of tables "is one of the worst features in ConnectedText." When you design them, "you don’t get any impression about how it is going to look until it is actually rendered." I cannot disagree, but then I do not use tables very much, and when I do, I usually use only the most primitive ones. My view is that that if you want something like a spread sheet, you should an application for spread sheets. My favorite Windows word processor (Atlantis) does not do tables at all, and I have never missed them. Another shortcoming he mentions is high memory consumption in Global Search and Replace operations. It is another issue I have never encountered because I use Global Search and Replace very sparingly, as you can easily do extensive damage to your database using such a powerful feature. But, however that may be, Miller himself notes in an addendum that this issue will be fixed in the next version, partly as a result of a discussion in the forum which led the developer (Eduardo Mauro) to finding and fixing the problem. And that is one of the greatest advantages of ConnectedText, a lively and helpful user community and an engaged developer, in addition to a great program. Today's ConnectedText is much more capable than the program I started using in 2005. 1. See also early notes about using ConnectedText by Jack Baty.